Randy Alcorn answers the "Faithful Fifteen" interview questions for the November 2004 newsletter of faithfulreader.com. 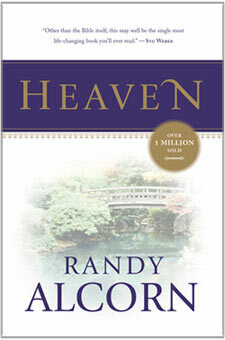 Question: What kind of testimony to your faith are you demonstrating in your book, Heaven? Is your goal to demonstrate your faith in your writing? Do you seek to do this in your fiction also? Answer: I’ve written fourteen nonfiction books and six novels. The novels, while different in style from nonfiction, are nonetheless touched by a biblical worldview and can reach some people who won’t be reached by nonfiction. (Fiction can have a Trojan Horse effect, where it moves inside the mind when the reader’s defenses are down.) I hope to shift readers to a more biblical perspective, partially by showing the positive consequences of right thinking and choices, and the negative consequences of wrong thinking and choices. My book Heaven is in some ways the most important book I’ve written, and certainly it is the most direct and thorough treatment of the biblical subject of Heaven. I emphasize looking forward to the New Earth, as 2 Peter 3:13 tells us we’re supposed to be doing, but which, due to our misconceptions about Heaven as a nonmaterial realm where we’ll live in a disembodied state, we don’t. We’re made to live as physical beings, not just spiritual, and on a real earth, which is exactly what the Bible says we’ll do after the resurrection, and after the millennium. Somehow we’ve failed to grasp this clear biblical teaching, and our view of eternal life has been distorted and impoverished. Question: When did you come to a saving knowledge of Jesus? Where are you today in your walk? Is your faith an important part of what you do? Answer: I was raised in an unbelieving home, and came to Christ as a high school student. My walk with Christ is more important to me than anything, and by his grace I have enjoyed the presence of Jesus ever since high school. That he would use me, with all my faults and weaknesses, is a testimony to his kindness and power. My faith in Christ is central to my writing and—I hope—to every part of my life. Question: Tell us about your church experiences, how you grew up (or maybe didn’t grow up) in the church, where you attend now, your involvement in your local assembly, etc. Answer: I grew up without Christ and without the church. When I was in high school I attended a church for the wrong reason—to see a girl I’d met. But God can use even our wrong motives for his right purposes. (In fact, years later that girl became my wife!) At that church and in the youth group there, I heard the gospel for the first time, and after a few months or so of attending, I was reading the Bible regularly, at home in my bedroom. It fascinated me, and it had the ring of truth. One day I realized I believed what it said about Jesus and everything else. I dropped to my knees, by myself in our basement, confessed my sins and gave my life to Christ. I have never once regretted it. Nanci’s my best friend and wife. We’re part of Good Shepherd Community Church (www.goodshepherdcc.org), where I was a pastor for thirteen years, before the Lord directed me into full-time writing. One of our sons-in-law is now our church’s college pastor, and our daughter helps him in ministry. The other son-in-law is a junior high teacher, and our younger daughter, his wife, is an emergency room nurse. We’re proud of both our daughters and both our sons. Question: Tell us about your current church family/fellowship. How does it influence your work? Answer: We love our church and it regularly and significantly influences our lives. We’ve led a small group Bible study in our neighborhood, coming out of our church ministry. We’ve been involved in many Bible study groups over the years. Nanci leads a women’s Bible study, I often teach different classes and occasionally preach, and we both mentor young people. I direct a parachurch ministry, but the local church is where it’s at. Question: Who are your spiritual mentors? Your professional mentors? Answer: My first youth pastor, Paul Siwick and my second, Stu Weber, both had a great influence on me. Stu and I were the original pastors of our church, where he still serves as lead pastor. Steve Keels, another of my pastors who was in the college group I led many years ago, is my closest friend besides Jesus and Nanci. Steve and I talk honestly and check on each other’s spiritual lives. Stu, Steve, and I meet on Wednesday mornings for Bible study, fellowship and prayer, and it’s a highlight of my week. I guess I don’t have a professional mentor per se. But I have sat at the feet of many great thinkers, writers, and God-lovers, including C. S. Lewis, Francis Schaeffer, A. W. Tozer, and John Piper. Question: Discuss your calling/mission—as a writer, and as a Christian. Question: What are your Scripture reading habits? Answer: I seek to spend time each morning in Scripture, though occasionally that time comes later in the day. Throughout most days I open my Bible periodically, to reference and meditate. Sometimes I use a Bible program to search for and study a certain text, etc. Question: What books have most influenced your work? Answer: Nonfiction: The Knowledge of the Holy by A. W. Tozer, Mere Christianity by C. S. Lewis, Knowing God by J. I. Packer, Desiring God, Revised & Expanded by John Piper, He Is There & He Is Not Silent by Francis Schaeffer. Fiction: The Chronicles of Narnia, 7 Volumes: Full-Color Collector's Edition by C. S. Lewis, The Chronicles of Narnia: The Lion, the Witch and the Wardrobe, trilogy by J. R. R. Tolkien, C. S. Lewis’s Space trilogy, especially Perelandra, Space Trilogy Series, The Singer Trilogy (including The Song and The Finale) by Calvin Miller. Question: Do you read secular fiction at all? If so, who are your favorite authors, and why? Answer: I’ve read and enjoyed John Grisham. My tastes are eclectic, but I have a special love for Conan Doyle’s Sherlock Holmes stories, and the Nero Wolfe mysteries by Rex Stout. I’ve read or listened on audio to most of the forty-seven Nero Wolfe books. Question: What are your other media habits—television, movies, music, etc.? Answer: Nanci and I enjoy good movies, but finding ones that don’t violate biblical principles is difficult. We do almost all our movie renting through companies that provide filtering of profanity and sexually inappropriate scenes removed. We like the old Sherlock Holmes series with Jeremy Brett, and the A&E Nero Wolfe programs (with one notable exception that was blatantly immoral). I’m an old science fiction fan, so “Star Trek,” “Stargate” and Star Wars are appealing, and as long as you filter out their worldviews, they can teach some valuable lessons in an enjoyable way. I’m glad we don’t have cable TV, or I’d be tempted to watch the SciFi channel too much! Our most regular television event is football, and our whole family gathers for Sunday night football each week. Nanci is a great football fan, and we’ve been able to meet players and go to games when I’ve been asked to speak in NFL pre-game chapels. That’s been a lot of fun. Question: Do you and your family have any special faith-based traditions? Answer: We enjoy a number of things centered on Thanksgiving and Christmas, including sharing times where each family member expresses his or her gratitude for God’s faithfulness over the previous years. Question: Tell us about your prayer life and habits. Answer: It has always been difficult for me to spend great lengths of time in prayer, and sometimes it’s been a cause of discouragement. On the other hand, God has graciously taught me about prayer and dependence on him throughout the day. I often get on my knees for brief periods in my office throughout the day. I pray as I hear of needs. Nanci and I stop and pray together various times throughout the day. I ask God to help me see prayer as an adventure in which I come into his presence and behold Him, and become so absorbed with Him that I don’t want to do anything else. I’ve had tastes of that, but long for more. Question: Describe what you believe is the role of writing in the Christian life. Answer: God is an author. The universe itself is his book. Each person is a chapter. History really is his story. Christ is the Word, the very essence of God, and expression of God. We are created in God’s image, and made to be sub-creators, authors who create and weave together both nonfiction and marvelous stories on which our imaginations can soar. When we write and read such works, He is pleased. As an author, I am very aware that I’m a steward of words, and I labor to get them right. Books and bookstores have had an enormous influence on my own life. My first youth pastor did me a huge favor—he gave me a key to his office, so I could go in any time and read his books, hundreds of them. I read everything I could get my hands on. There was an elderly couple in our church, named Bill and Martha Kuntz. They had a Christian bookstore in their house in Gresham, Oregon, my hometown. I would go there several days a week, for hours at a time. They would point out books for me to read. They introduced me to Lewis, Schaeffer, and Tozer, and books such as Tortured Wonders, God's Smuggler, Through Gates of Splendor, and The Cross and the Switchblade. Over the years I bought and read portions or all of thousands of good books, many of which are now in our church library. I cannot divorce God’s works of grace in my life from good books. In my book Heaven, I talk about books the Bible says are now in Heaven, and I give arguments for believing other books will be written and read on the New Earth. Question: Tell us about one or more of your favorite encounters with readers. Answer: I met a young man who told me he was going to commit suicide. Then God put one of my novels into his hands and he read it, and the Lord turned his life around. Another man told me that his wife was also suicidal, and she too had her life changed by reading one of my nonfiction books. One of the most touching things I’ve experienced is receiving videos of memorial services where my books have been read from and passed out. Some have been teenagers, and their photos are enclosed with notes from their parents saying something like, “Deadline and Edge of Eternity and Safely Home were his favorite books.” I can’t wait to meet these people in Heaven. Question: Would you share a story about someone you’ve brought to Christ or share how your writing has helped someone? Answer: God has graciously given me many of these stories, but here’s a short one. Once on a flight back from the East Coast I engaged a young man in conversation who said he was of Persian descent. He was coming out to attend the University of Oregon, a school not known for its Christian commitment. I spoke briefly of my faith in Christ, and then gave him one of my novels, Deadline. I prayed for him for a few weeks and then didn’t think much more about him. I have the privilege of daily receiving letters from people—prisoners, pastors, homemakers, business CEOs, students, teenagers—who tell me they’ve been changed by reading one or more of my books. But in eternity it will be great to hear more stories, and great for me to come to innumerable people who’ve written books—and done far more important things—that have shaped me. I look forward to saying “Thank you,” then having a great discussion over the best dinner we’ve ever tasted! Note: This interview originally appeared in the November 2004 newsletter of faithfulreader.com.